After my Christmas inspiration post last week, there has been serious reader request-age for a Christmas stocking tutorial! So, it's in the works. In addition, we made THE most amazing fireplace/mantel decor! I love it, can't wait to share it soon. Husband helped. He was very sweet. 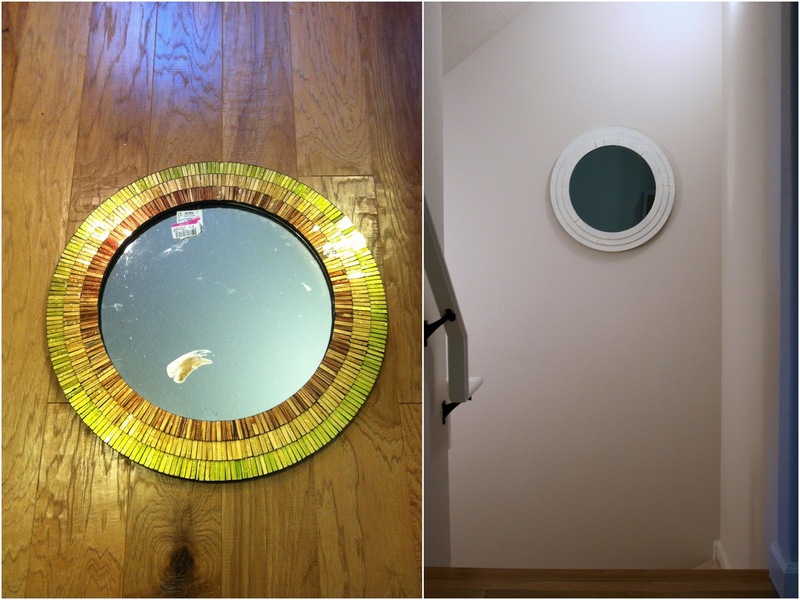 Also improved by some spray primer and white spray paint... this round mirror I got at Ross on super clearance because it was dirty, eew, and had some missing colored mirror trim pieces. I cleaned it up and gave it a new home in the stairwell going down to the basement/garage/bonus room. That stairwell area was super boring. I like seeing myself and my feet as I head down the stairs! Lots more to share when I can! Any awesome holiday successes at your house these days? I always love to see original holiday DIY ideas. 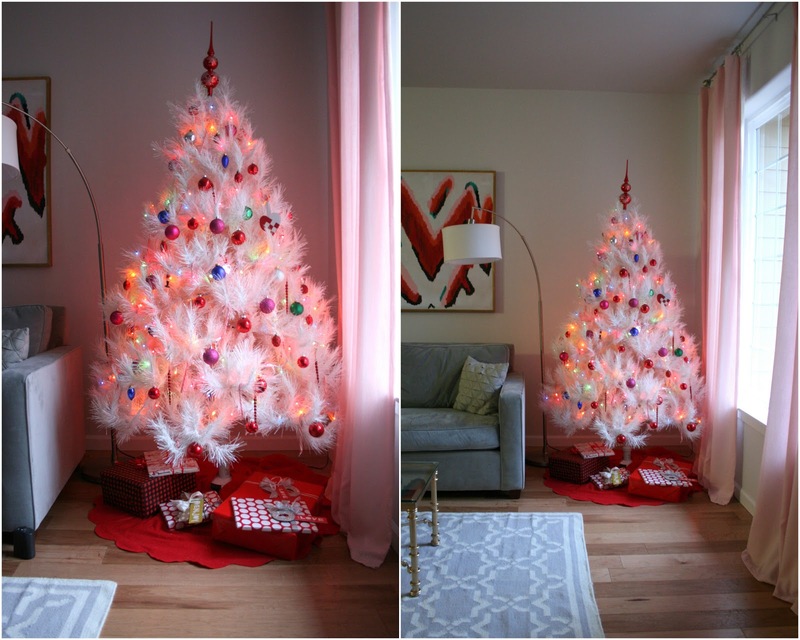 Your tree looks perfect-- I love how the ornaments stand out against the white. The tree looks great! Until you accumulate them (which you surely will) the cheapy little colored balls look awesome on a white tree, and you won't cry if they get broken. Excited for the stocking tut!! Thanks for taking my suggestion into consideration! I'm always amazed about how much you get done in a weekend. My house is still in boxes and yours is already looking like a home! Love the white tree so much! Looks great! Yay! I love how Christmas-y your house looks. I'm excited for the tutorial! Seriously what can't a good coat of white paint can't do? Your tree is SO PRETTY! Like it was custom made for your space. Legitimately one of the loveliest trees I've ever seen. 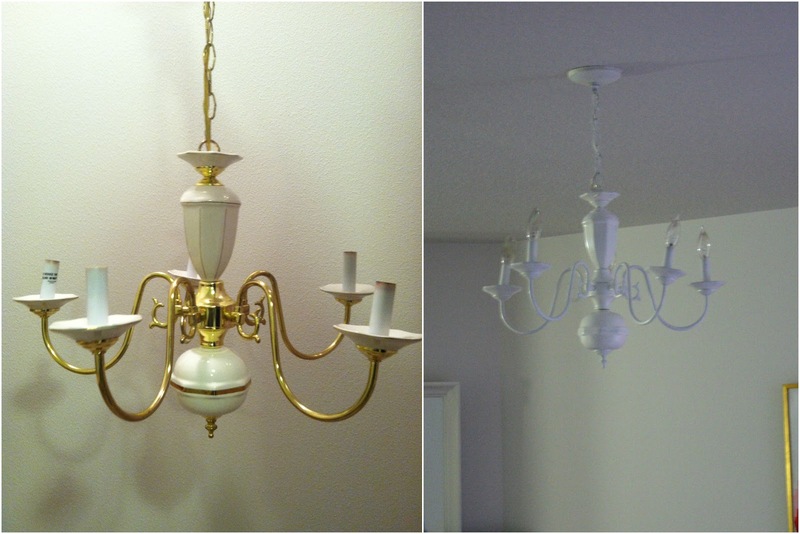 I love your mirror/chandelier quick fixes! What a difference some white paint makes. Both look so pretty and fresh. I wanted to thank you for recommending the Low Christmas album to me! I'd never even heard of the band before. I'm enjoying it SO MUCH! And I had no idea that Sufjan was releasing a new holiday album! SO excited.